Another week, another change at No. 1. In the last two updates we’ve had Edwin Evers and Kevin VanDam both sitting in the No. 1 position. But last week we also hinted that Andy Morgan has quietly been on a tear and could take the crown. Turns out, we were right again. With his ninth at the PAA event at Fort Loudon-Tellico over the weekend and the 2011 FLW Tour event on the Red River dropping off, Morgan is now the No. 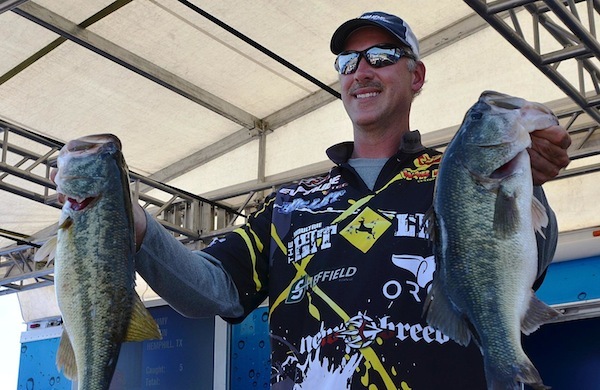 1-ranked angler in the Majors Ranking. How did he rise? He’s finished in the top 15 in eight of his last nine events going back to last year. That’s how. It’s been a long time since he last won a Major — the 2007 FLW Tour Beaver Lake event — so Morgan tends to fly under the radar, but there is no denying how good an angler he has been over the last two years. While the PAA event caused the biggest move, the dropping of the FLW Tour event caused plenty of its own. In the top 10 alone we had Cody Meyer moving up to fourth, David Duley slipping to sixth, Luke Clausen moving into the top 10 in seventh, Mark Rose slipping to eighth and Ott Defoe slipping out of the top 10 to 11th (though, those last two were because of the PAA event). Wesley Strader’s third at Fort Loudon-Tellico moved him back into the top 20, as he now resides in 18th, and Shinichi Fukae’s top 10 and Matt Arey’s near-top 10 nearly did the same, as Fukae climbed to 21st and Arey to 23rd. Meanwhile, Jay Yelas and Jason Christie both slipped with the Red River event dropping off. Some other notable moves in the top 40 in the last week include Ron Shuffield (35th to 26th), Stetson Blaylock (38th to 30th), Glenn Browne (39th to 31st), Dave Lefebre (26th to 34th), Dan Morehead (49th to 36th), Chad Grigsby (53rd to 38th), Scott Suggs (47th to 39th), JT Kenney (33rd to 41st) and Robbie Dodson (34th to 49th).